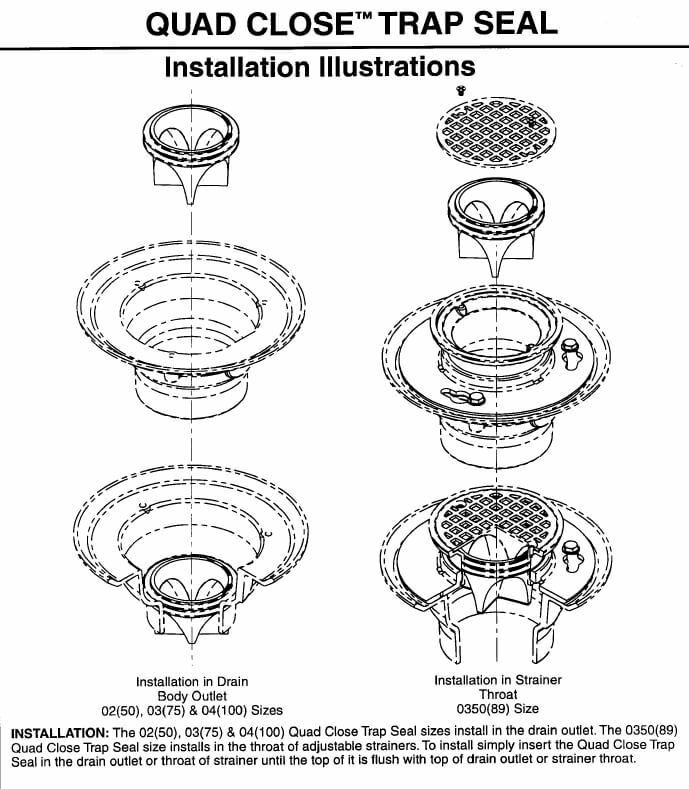 Five Things to Consider When Using an Inline Floor Drain Trap Seal - Jay R. Smith MFG Co. According to the International Plumbing Code (IPC), traps are intended to provide and maintain a physical barrier between a building and its drainage system and prevent the emission of sewer gases into the building. Floor drains that do not routinely receive drainage to maintain the water seal require mandated assistance from a trap seal primer device. Typically a trap seal primer valve is used to rectify the problem of evaporation of the water seal. Inline floor drain trap seals are now often being used as an alternative to trap seal primers where building code allows, or as an extra layer of protection against sewer gas emissions. With additional inline floor drain trap seals coming on the market, there are five things you should consider when making your selection. While just about any inline floor drain trap seal is easier to install than trap seal primer valves, some are more worthy than others. Look for trap seals that do not require special tools to install directly into the drain outlet or the throat of your strainer. While a special tool may not seem like a big impediment when first installing a trap seal, it could become an issue if the seal needs to be removed and reinserted to snake the drain. An inline floor drain trap seal is not going to save you time and money no matter how easy it is to install if it doesn’t fit your current pipes and drain outlets. You want to make sure the trap seal you select does not just fit its manufacturer’s pipes and drain outlets, but those of any manufacturer that are currently installed in a retrofit or new build. A good trap seal is designed to handle a wide range of pipe and internal body diameters; this includes 2″, 3″, 3 1/2″ & 4″ PVC and Cast Iron Pipe. In a perfect world, we would only have to worry about water flowing into a drain, but this is rarely the case. Your inline floor drain trap seal should be made from a chemically resistant elastomer. You also want to choose a thick and durable product making it less vulnerable to UV, chemicals, cuts and tears per requirements for ASSE 1072. For areas where beer and soda will come in contact with the drain you want to be sure your product is internally lubricated to prevent these substances from sticking to the device causing debris buildup. Another thing to consider is the potential of larger debris, such as cigarette butts and larger food particles as you have in a stadium and or restaurant, passing through the drain. While it is recommended you install a grate opening to prevent debris from entering the drain in the first place, you also want to make sure any rogue debris is able to pass easily through the drain trap. Typically sewer gas is heavier than air; thus a small amount (so small it is nearly immeasurable) of back pressure should close the trap ensuring the sewer gas remains in the trap. Be sure the performance of the trap seal you are using meets (or even goes beyond) what is required per ASSE standard 1072. A tight seal will also help prevent the evaporation of water in the trap in the first place. Another consideration is how much back pressure the seal will hold in the event of a backflow event. You want the seal to hold at least 10.00” of back pressure.